Children as young as 3 have got involved in decopatching, but it's probably better suited to children who are old enough to wield a paintbrush without you worrying they are going to paint their hair! 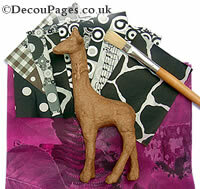 See our Decopatch photo tutorial to see how easy it is. Kids will love the fast results and parents will love being able to recycle household items. You can decopatch furniture. A great project for the school holidays would be to decorate an old piece of the child's bedroom furniture. A quick project for a rainy afternoon would be to Decopatch a drinks coaster or a table place mat. You can buy decopatch party packs for children's parties or a single kit as a gift/starter pack. 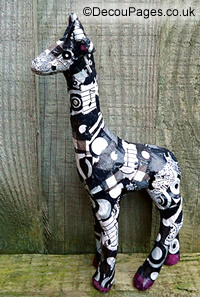 Click here to buy Decopatch kits. Decopatch glossy glue-varnish and their glitter glue-varnish are both non toxic. All the Decopatch glues, varnishes and primers are water based so they don't contain any nasty solvents and don't smell. You can also wash decopatch brushes out with soapy water. As with any craft activity, young children should be supervised while decopatching. Sensible precautions include aprons, rolled up sleeves, hair tied back and table protected.